The Riverwatch Rider dismounted and sat down by the cool stream, exhausted, cupping his hands to drink up the water. He’d been sent to scout out rumors of marching, armored skeletons but hadn’t seen any signs of such a nightmarish, impossible thing. Still, when he noticed a skeletal corpse submerged beneath the water just a few feet from him, he started. Then laughed. Really, how could a skeleton march? But suddenly as the current slowly turned the skull over and the hollow eyes rested upon him, the decaying jaw seemed to smile. Shockingly fast, it rose up, quaking, immense, angry and alive. The rider screamed, scrambled to his feet, and ran. For years, two factions – the noble Daqan Lords and the demonic Uthuk Y’llan – have waged a bitter war throughout the realm of Terrinoth. Yet now townsfolk and famers alike are murmuring that another army is approaching, as well-ordered and fearless as the Daqan, as ruthless and savage as the Uthuk Y’llan. The legions of the undead have taken up arms and are marching on Terrinoth. 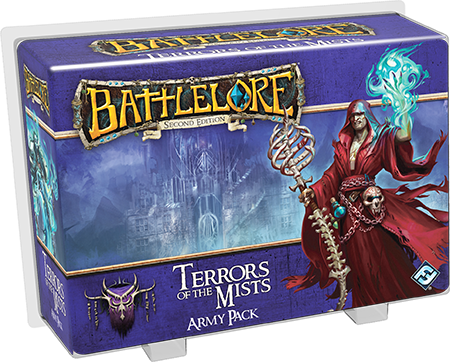 Recently we announced two Undead Army Packs for BattleLore Second Edition. 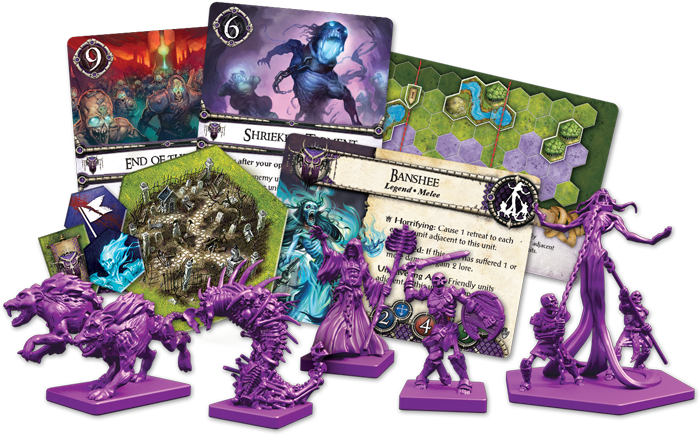 Each brings to the battlefield a unique range of units for this all-new faction, along with a specialized Lore deck, scenario cards, new terrain, and everything you need to deploy the Undead into battle. 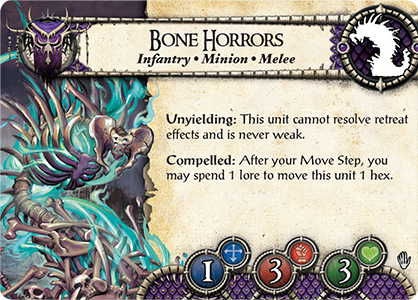 Today’s preview introduces the five units of the Terrors of the Mists Army Pack, from its shambling, mangled Bone Horrors to a towering, shrieking, untamable Banshee. Centuries before the current war between the Daqan and Uthuk Y’llan began, a wrathful and corrupt general, Waiqar, made a terrible vow. He swore that neither he nor his men would rest until they had claimed ultimate power. But the vow backfired and transformed into a curse: Waiqar and his men never achieved victory, and instead were doomed to eternal living death. Waiqar is now known as the Undying, a powerful, commanding creature that the living dare not encounter. His men died as the final words of his curse hung in the air, but rose again as powerful undead warriors. As each of them are felled in battle, Waiqar and his disciples gather the dark magic that animated them and pass it on to a host of waiting corpses. Those skeletal footsoldiers, known as Reanimates are the core Infantry of the Undead forces. 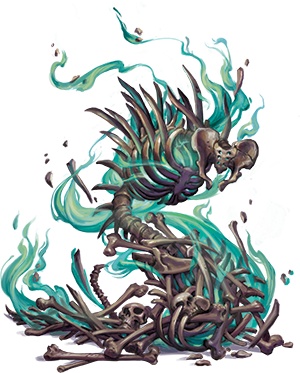 Their strength lies in their numbers: for every figure remaining in a Reanimates unit, one die is added to each combat roll. Being already undead, Reanimates can also easily recover heath. For every result, they regain one health, meaning one figure in the unit – and one die in combat. Creeping alongside the Reanimates are kindred evil spirits embodied in a more chaotic form. Bone Horrors are animated piles of bones – perhaps human, perhaps animal, perhaps a mixture of several species. Since the spirit unifying the bones together never loses strength, Bone Horrors are never weak and do not retreat. However, the unyielding Bone Horrors can only move one hex at a time of their own will. If you spend lore to compel them though, you can double their range. 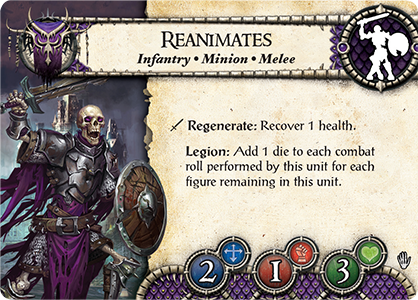 Reanimates and Bone Horrors are both Minion units, numerous, flexible, and inexpensive to muster. 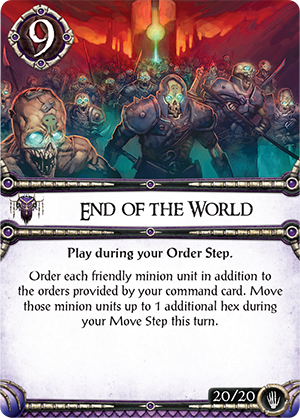 The End of the World lore card, in fact, enables you to command all your minion units at once and launch a huge, menacing assault against your opponent. 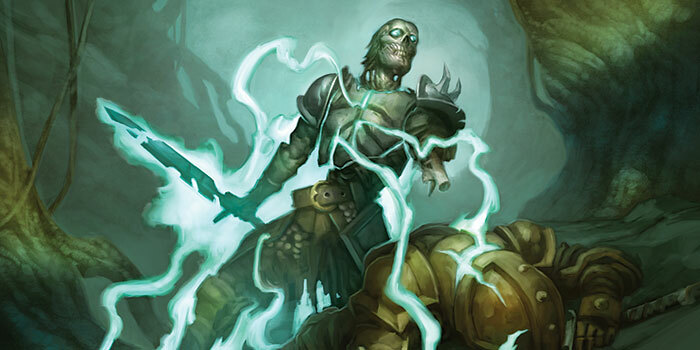 You can also transform your slain opponents into friendly minions: by playing the Raise Dead lore card, you can remove one of your minion units from the board, whether at full health or not, and fill the corpses of a defeated enemy unit with those soldiers’ immortal spirits, so that your newly-dead opponents become a fresh minion unit, at full health and ready to serve you in battle. Not all soldiers in the Undead legions are undead. 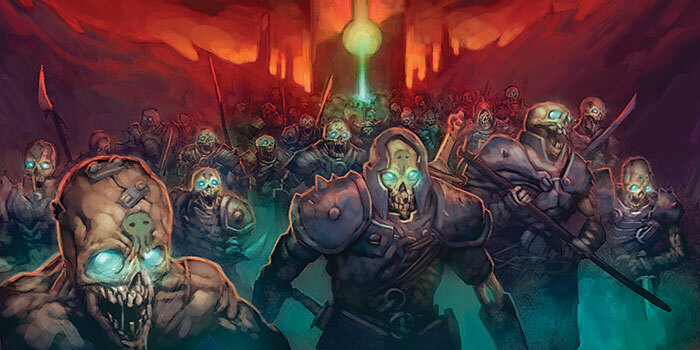 Necromancers are living, breathing, mortal sorcerers who have been promised incredible earthly rewards for their enlistment in the Undead armies. Necromancers are a magic-wielding Caster unit, perfectly matched against the Greyhaven Battlemages of Hernfar Guardians and the Blood Sisters of Warband of Scorn. 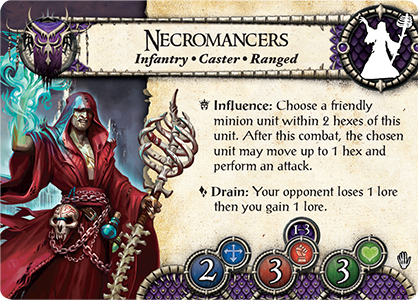 Always preying upon their enemies, the Necromancers’ result grows your lore by stealing it from your opponent, rendering them more vulnerable to your army’s uncanny weapons and grave-birthed horrors. These corrupted human sorcerers are most remarkable not for their choice to serve the Undead while alive, but for their power over the Undead units that surround them. Necromancers may use a result to command a nearby friendly minion unit to move and attack. 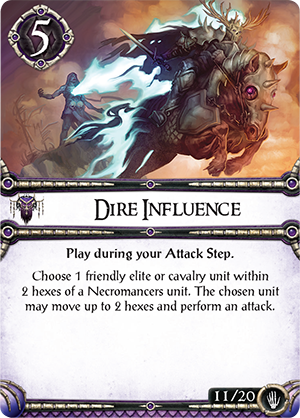 In addition, the Dire Influence lore card expands the Necromancers’ power over other units, allowing them to command monstrous elite units and charging cavalry. By combining that card and their ability with a cleverly played Command card, you send your entire army to attack in a single turn, surprising and overwhelming your embattled foe. Many more forms of undead exist in the world than walking human remains. Some may never have been alive at all, but inhabited an undead form since time immemorial. 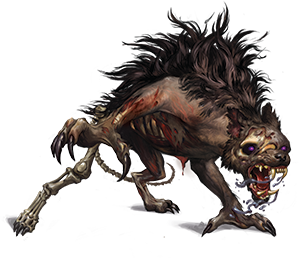 Barghests are large, black, canine ghouls who may have never lived as wolves or dogs, but for centuries have been known to prowl around graveyards and prey upon townsfolk in the dead of night. They join Waiqar’s army not for power or glory, but for that chance at an unprecedented feast upon living meat. 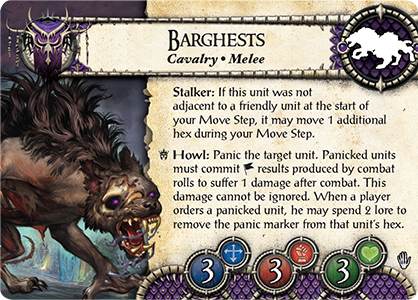 The Barghests’ red-eyed and fanged faces may be terrifying, but their howls are worse. With a result, these beasts fill the air with that bone-chilling sound and panic enemy forces. Panicked units suffer one damage after combat for any results rolled during the fight – damage that cannot be ignored. As Stalkers, these beasts prefer to lurk away from the mass of troops and sneak up their victims. If not adjacent to a friendly unit at the start of a move step, they can move an additional hex. Barghests may also become invisible at will. 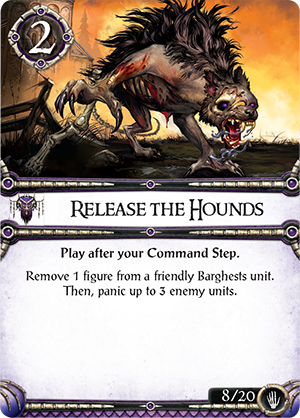 By playing Release the Hounds , you can make one Barghest disappear, even as its howl resounds over the battlefield and panics enemy units. 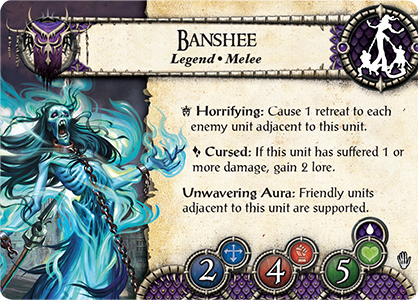 Like the Barghests, the Banshee is a wild creature doomed to exist somewhere between life and death. She does not fight in Waiqar’s army willingly, however, but must be captured, chained, and forcibly led into battle. A wretched, screaming Banshee is so Horrifying that a result causes all adjacent enemy units to shrink away from her, even as her Unwavering Aura of darkness and death gives support to adjacent friendly units. 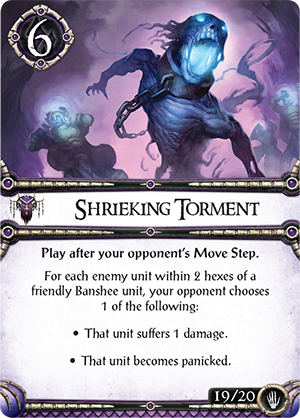 With the lore card Shrieking Torment in play, the Banshee’s painful voice forces your enemy’s nearby units to choose between suffering damage or becoming panicked. A Banshee does more that frighten others with her horrifying presence and awful shrieking. She is quite able to stand up to a Chaos Lord, Roc Warrior, or any other Legend unit, rolling four dice in combat and requiring five blows to be defeated in battle. Even when wounded she grants her commander fiendish powers, giving you two lore for every result in combat if she has suffered damage. Few units in the game of BattleLore gain abilities from suffering damage, even fewer fill the hearts of enemy fighters with such tremendous fear. As commander of the Undead, fear is one of your strongest weapons. No Daqan or Uthuk Y’llan army can wield it so effectively as these legions of walking skeletons and shambling bones, stalking brutes and screaming fiends. Yet you cannot rely on fear alone if you want to conquer the kingdoms of the living. You must use your tactical skills to make the units of Terrors of the Mists as lethal and formidable as possible. 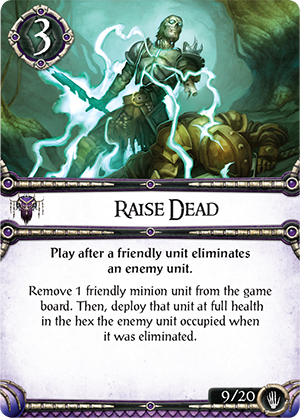 Our next preview will feature the units of the other upcoming Undead Army Pack, Heralds of Dreadfall, which you can combine with those of Terrors of the Mists to create your own fearsome and formidable Undead army. You can also harness the Mountain Giant or Great Dragon into your Undead army – both of these legendary creatures will become available soon. Finally, if you haven’t yet played BattleLore Second Edition, you can demo it in the Fantasy Flight Games booth at Gen Con. Pre-order Terrors of the Mists and Heralds of Dreadfall from your local retailer today!